The San Francisco Chronicle published an article today, "New Apple Watch reignites concerns over radiation" (Catherine Ho, September 25, 2017). Since the new Apple Watch can operate like a cell phone, some public health researchers and medical experts have raised concerns about the potential health risks from exposure to the radiation emitted by this device. "There is no definitive data from federal health regulators showing a direct link between cell phone radiation — also known as radio frequency radiation — and health problems in humans. But recent research indicates that exposure to cell phone radiation is the likely cause of malignant growths in the brains and hearts of male rats, and can cause neurological damage in rats born to mothers that were exposed to the radiation during pregnancy." The article mentions my successful lawsuit against the California Department of Public Health. It also discusses the cell phone radiation and cancer study conducted by the National Toxicology Program. Neither Apple nor the CTIA would comment on the story. The article is available at http://bit.ly/aplwatch3. Before reading what Apple reports (below), I suggest you read the following posts on my website which discuss why the SAR is not a reliable measure of the potential health risks from using a wireless device on or near your body. Apple Watch has been tested and meets applicable limits for radio frequency (RF) exposure. Specific Absorption Rate (SAR) refers to the rate at which the body absorbs RF energy. 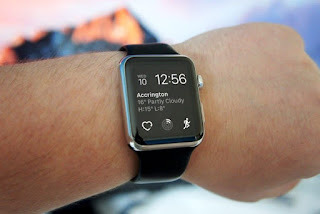 SAR limits depend on whether Apple Watch is used against the head or on the wrist. In the U.S, and some countries, the SAR limit is 1.6 watts per kilogram averaged over 1 gram of tissue for use against the head and 4.0 watts per kilogram averaged over 10 grams of tissue for use on the wrist. In other countries, the SAR limit is 2.0 watts per kilogram averaged over 10 grams of tissue for use against the head and 4.0 watts per kilogram averaged over 10 grams of tissue for use on the wrist. The SAR distribution at the exposed side of the head or body was measured at a distance no greater than 5.0 mm from the inner surface of the shell. Devices that are designed to be worn on the wrist may operate in speaker mode for voice communication, with the device worn on the wrist and positioned next to the mouth. When next-to-mouth SAR evaluation is required, the device is positioned at 10 mm from a flat phantom filled with head tissue-equivalent medium. The device is evaluated with wrist bands strapped together to represent normal use conditions. Devices that are designed or intended for use on extremities or mainly operated in extremity only exposure conditions; i.e., hands, wrists, feet and ankles, may require extremity SAR evaluation. When the device also operates in close proximity to the user’s body, SAR compliance for the body is also required. When extremity SAR evaluation is required, the device is evaluated with the back of the device touching the flat phantom, which is filled with body tissue-equivalent medium. The device was evaluated with Sport wristband unstrapped and touching the phantom. For Metal Loop and Metal Links wristbands, the device was evaluated with wristbands strapped and the distance between wristbands and the phantom was minimized to represent the spacing created by actual use condition. Although this device has been tested to determine SAR in each band of operation, not all bands are available in all areas. Bands are dependent on your service provider’s wireless networks. Looking across the Series 4 models, the highest cellular transmission SAR was 0.37 watts per kilogram (W/kg); the highest Wi-Fi SAR was 0.17 W/kg; the highest Bluetooth SAR was 0.13 W/kg, and the highest simultaneous transmission SAR (cellular plus Wi-Fi) was 0.50 W/kg. Apple has posted information on its website about the Specific Absorption Rate or SAR for the Series 3 Apple Watches. Specific Absorption Rate (SAR) refers to the rate at which the body absorbs RF energy. SAR limits depend on whether Apple Watch is used against the head or on the wrist. In some countries, the SAR limit is 1.6 watts per kilogram averaged over 1 gram of tissue for use against the head and 4.0 watts per kilogram averaged over 10 grams of tissue for use on the wrist. In other countries, the SAR limit is 2.0 watts per kilogram averaged over 10 grams of tissue for use against the head and 4.0 watts per kilogram averaged over 10 grams of tissue for use on the wrist. During testing, Apple Watch radios are set to their highest transmission levels and placed in positions that simulate use against the head, with 10 mm separation, and on the wrist, with no separation. When placing Apple Watch near your face, keep at least 10 mm of separation to ensure exposure levels remain at or below the as-tested levels.